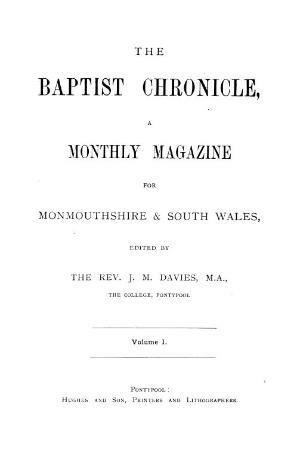 A monthly periodical that serviced the Baptist churches of Monmouthshire and which published religious articles alongside denominational news. The periodical was edited by Joseph Morlais Davies of Cardiff Baptist College. Associated titles: The Monmouthshire Chronicle (1891); The Baptist Sunday School Record (1897); The Baptist Record (1898-1939); The Crusader (1940).